If you are interested in signing your kid up for guitar lessons in Toronto, we suggest taking a trial lesson with a couple different guitar instructors. Ask each one about his or her approach to teaching children. You’ll be surprised to learn that some may use structured method books while others discourage it. Either choice is valid, as long as the instructor’s approach to teaching matches how your child learns best. The top three guitar method books for kids come from Hal Leonard, Alfred’s, and Mel Bay. The books from any of these publishers work very well with kids. Parents tend to like this graded approach because their child’s musical progress is measurable. As long as little Johnny is passing his songs and exercises each week, mom knows she’s getting her money’s worth. Method books are the only way to get kids to learn how to play guitar and read musical notation at the same time. The single note approach works well with small kids because they are able to play single notes without too much difficulty. In higher levels, they will learn easy-to-play chords. Within the first few lessons, students will be able to play simple, recognizable melodies such as “Twinkle, Twinkle, Little Star.” However, most kids these days don’t find these generic songs exciting or rewarding. Therefore, it’s important the teacher supplement these lesson books with fun songs that the student likes. Even though method books provide a firm and solid foundation in guitar and music theory, tweens and teens often find method books (including adult books) slow and boring. They are more anxious to play real songs that they can identify with. They demand instant gratification. For students like this, the guitar teacher might prefer to teach by ear., meaning they focus on performance technique and how to lift songs by ear. Learning guitar by ear focuses exclusively on developing listening skills and playing technique. Typically, the student or teacher mutually agree on a song to work on. Using a recording of this song, the lesson is spent playing sections of the song over and over while the teacher breaks the notes and chords down into easy-to-learn fragments for the student. These pieces are then strung back together until the song can be played in entirety. The major pitfall of playing by ear is that the student’s music theory knowledge will be fragmented. They will have no ability to read notation and the older they get, their lives may become too busy to ever bother to learn. Nevertheless, if this is the only method that will keep a student from quitting music altogether, then it is absolutely the best method for them. Besides, there are countless famous guitarists who can’t read music. The major obstacle guitar students face is frustration. This is true for guitar student of all ages, but perhaps even more so for children. Learning the guitar takes time, patience, and lots and lots of practice. 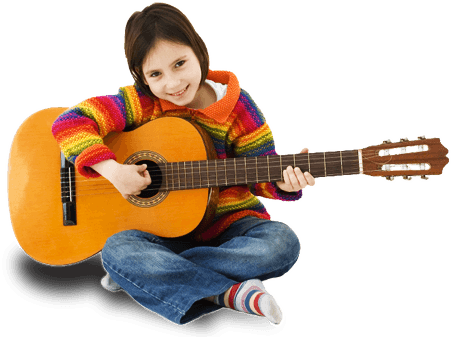 Getting a new guitar for Christmas can easily make a kid look forward to guitar lessons but the initial enthusiasm may wane once the guitar lessons begin. Parents can help their child be keeping a few things in mind. 1. Kids should practice 15 to 30min a day, three to seven days a week, depending on their age and goals. Find a regular, predictable practice time slot that fits into your family schedule. Most children need to be guided when and how long to practice. Many parents make the mistake believing that their child should want to practice on their own. They couldn’t be more wrong. Kids are kids! They are distractable and don’t understand the amount of work it takes to do great things. They need encouragement and constant reminders to focus and work towards their goals. 2. Pay attention and offer praise and encouragement after every lesson, practice session, and performance. While this is an obvious parenting tip for young kids, keep in mind that teenagers also need to be encouraged and appreciated, as they tend to connect their musical talent with their emerging personal identity. 3. Expose your kid to a wide spectrum of music and guitar players beyond what’s on their Spotify playlist. Keep them inspired! Let them know there’s better things to aspire to than playing “Mary Had a Little Lamb”. In you are interested in signing your child up for guitar lessons in Toronto, contact Elite Music Academy at 416 406 5355 or book a trial music lesson.